Is the low cost living in Pattaya a possibility for you? To retire in Pattaya is a dream come true for many people and some of them find a wonderful Thai Woman. For others however it becomes nothing more than sleeping in and spending nights (and their money) in bars and on Thai girls. There is nothing wrong with that, if that is what one wants. Retirement in Pattaya has so much to offer yet it is easy to become bored with life in Paradise after the initial euphoria fades. you need to have interests in activities. 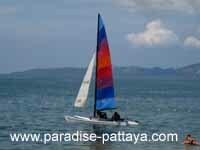 Before you retire in Pattaya come for a mini-retirement and check out the low cost living for yourself. Six months is a good test run and should give you a fairly good insight. You will find out if Pattaya is really for you. Rent an apartment or condominium in Pattaya before you buy a condo or home. A mini retirement will also give you the chance to see if you want to retire in another country. Within six months you will also have the opportunity to visit other places in Thailand and see if you may like it better in another part of Thailand. Pattaya is not a true representation of Thailand even though geographically it is located in the Kingdom of Thailand. After six month you may realize that you may want to live in a quieter area. Many people came to retire in Pattaya and then moved to a different area. That sometimes happens when someone finds a Thai wife. Learn the Thai language so you can communicate with Thai people. Thai people appreciate when a foreigner tries to speak their language. There are many expats in Thailand (and Pattaya for that matter) who never learn Thai and never get a deeper understanding of the Thai culture. In my opinion learning the Thai language is essential to a successful retirement in Thailand and Pattaya. Thai people will complement you on your Thai, and efforts to speak Thai, which makes learning the language easier. Of course you want to make friends with other expats in Pattaya as well and in my experience there is no problem with making friends. • can provide referrals on many subjects. One of the best online forums to find helpful expats is ThaiVisa.com. Join their forum and ask questions and read what others are talking about. Sine you are online reading this, I assume you will own a computer or will access to a computer when you are in Pattaya. There are many internet cafes and places like TOT which only costs 20 Baht an hour for internet access. The internet also enables you to stay in touch with your friends and family abroad. Besides email you can have conversations online for free these days through instant messengers. Online telephone services like Skype.com are very cheap if your friends or family do not have a computer. Oftentimes good books are not easy to come by in Thailand and when you retire in Pattaya the internet may become one of your best friends. Want to fund your own low cost living lifestyle with the net? Check out my story and how you can make it happen too! How much money do you need to retire in Pattaya? A question that is asked many times and that is one of the reasons why I suggest a mini retirement so you learn about what your desired lifestyle will cost you. It depends on many factors. Health may be the most important and costly factor but it's a fraction of what it is in many other countries. It is possible to live and retire in Pattaya for 20,000 Baht a month. For some this is not the kind of lifestyle they want to lead but it is possible for one person. Thinking About Getting a Low Cost Place In Thailand? The most concerning expense anywhere you live in is that - where you live. Check out Expat Condos and get a better idea of the various price ranges and what the places look like. In any case the best way to know how much you'll end up spending in a place is by going there. I recommend doing a vacation trip first to get a good idea of what things cost and how you're life will be like. Also keep in mind - the first few weeks anywhere will be the most expensive ones. Once you're in the groove it's all smooth sailing afterwards. You'll be able to live on a much cheaper budget once you know your way around.